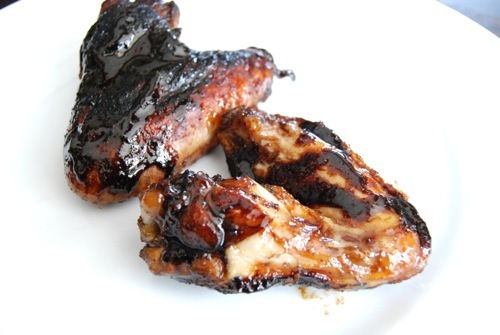 There’s something very decadent about sticky glazed chicken wings. It’s partly the way they’re consumed, meat in hand, primitive bone sucking and audible moaning allowed. And how even after they’re finished, their memory remains in tangible form, and sticky fingers must be licked once more. 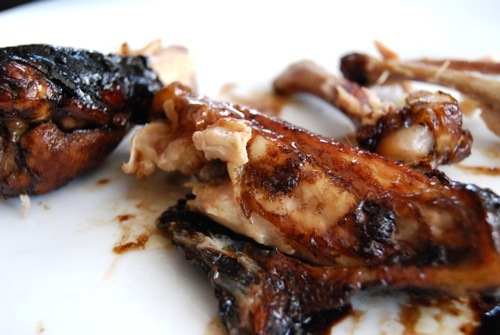 It’s the satisfying indulgence of consuming caramelized, coated and crispy skin, and leaving a plate of naked bones behind. Face it. Chicken wings are party food. So what better way to enjoy today’s Fat Tuesday Mardi Gras celebration than by whipping up a batch of wings, popping open an ice cold beer and digging in? 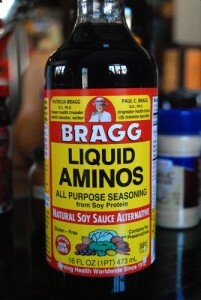 Adapted from Food Network Kitchens Favorite Recipes, this low sodium version takes advantage of another wonderful low-so product that may be new to some: Bragg Liquid Aminos. Preheat oven to 450 degrees. Line a baking sheet with aluminum foil and set aside. Wash the chicken wings and pat dry. 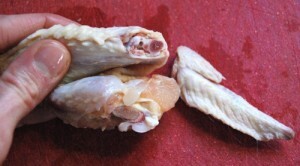 Remove wing tips if present by cutting at joint, as in photos below. Place wings into a large mixing bowl and set aside. 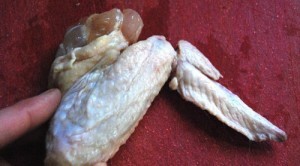 Save wing tips for stock or discard. 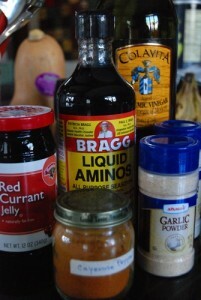 Measure the jelly, balsamic vinegar and Bragg Liquid Aminos into a small saucepan. 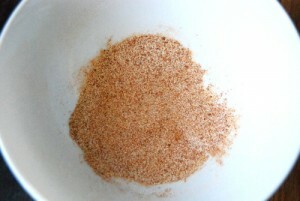 Place pan over medium-high heat and bring to a boil, stirring occasionally. 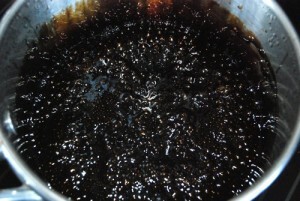 Boil 5-7 minutes until mixture turns thick and glossy. 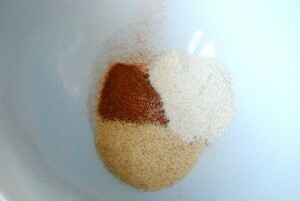 While mixture is boiling, measure the cayenne, garlic and onion powders into a small mixing bowl. Whisk well to combine. 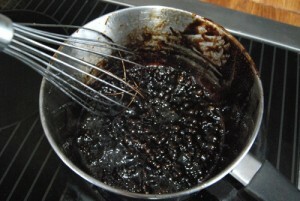 Once mixture has thickened on stove top, remove from heat and whisk in the seasonings. 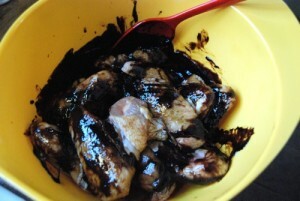 Pour mixture over the chicken wings and toss well to coat. 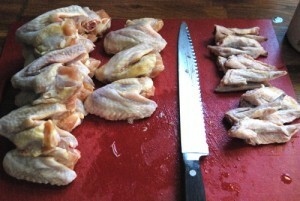 Once wings are coated thoroughly, arrange the chicken on the baking sheet, meaty side DOWN. Return the sauce to the small saucepan and set aside. 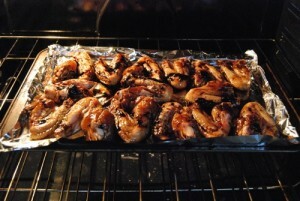 Place baking sheet on middle rack in oven and bake 10-12 minutes (less time for small wings, longer for larger ones). 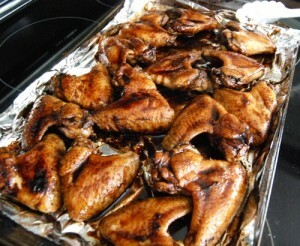 Remove sheet from oven and turn wings over. Return to oven and bake another 10-12 minutes. Towards the end of the chicken’s cooking time, place the small saucepan of sauce over medium-high heat and bring to a boil. Reduce heat to low and simmer a couple minutes. At the end of the baking time, turn on the broiler and broil the chicken for 3-4 minutes more, until chicken is richly colored and glossy. 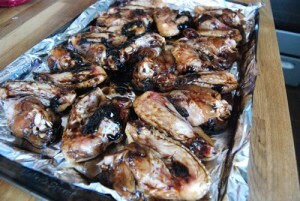 Remove from oven and drizzle the remaining sauce over top of the wings. Serve immediately. This entry was posted in Appetizers, Snacks and tagged Bragg Liquid Aminos. Bookmark the permalink. Wings and beer are just classic. nice variation from barbecue sauce. cant wait to try these. how do you keep them from sticking to the foil? “Liquid aminos” isn’t quite the most appealing name, but . . . the wings still look great. I was under the impression for the longest time that I didn’t like wings, but it turns out I just didn’t know how to eat them! 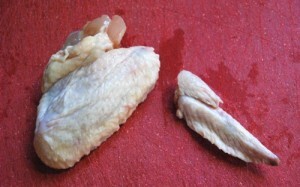 Once someone taught me how to snap the two bones apart, I was a finger-lickin’ fool. Hey inky – WOOHOO! is right! Those wings are GONE. No beer yet – but as we spent half the day in the ER, that’s not far off. Better yet, I bet there’s a glass of red wine w/ my name on it.. it IS almost wine o’clock. Adrianne, you will LOVE these. But no need to stick simply to wings. This sauce would be perfect on any chicken – drums, thighs, even breasts. SO GOOD. Hi Joan! Great question. You could try brushing the foil w/ a little oil before arranging the chicken, but otherwise don’t think it’ll be a problem. I didn’t do anything to keep them from sticking and only had a little pull on a couple of the wings. Bonus? I tossed the foil afterward, so very little clean up. Katie, I agree the name’s a bit off-putting. Sounds like chem lab stuff. But the results are heavenly. 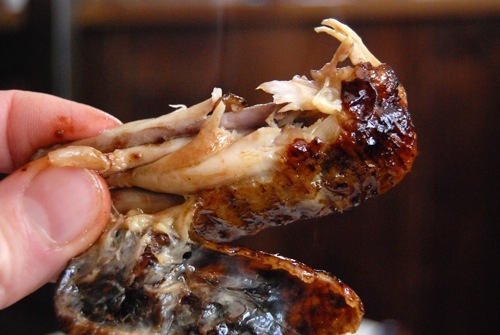 I love BBQ – anything sticky and finger licking gets an A+++ from me!! Thanks so much for this great post! These look yummy. 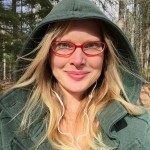 I have been reading your blog for some time now since I was diagnosed with Meniere’s last October. 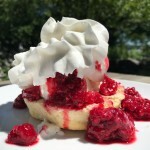 You have some of the best lo-so recipes out there and you really are doing a wonderful service in sharing these off-the-beaten-path products. I tried the Garden City roll-ups you shared in the previous post and they are awesome! Thanks again. Hey Jay! WELCOME. So glad you’ve been enjoying not only the site but some of the products. Those lavash are amazing. I always buy extra (my older daughter likes them so much better than regular tortillas). Fortunately they freeze really well, so I can keep a stock on hand. Or at least try, but they never last — LOL. Hope you make and enjoy these wings — truly finger licking GOOD! 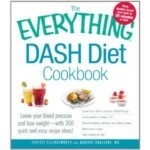 wow, your recipes and photos are SO tempting and this one is no exception! i’m not such a huge fan of chicken on the bone–i feel a bit savage eating meat with my hands and don’t like sticky fingers–but would consider using this sauce on sauteed chicken tenders! i’m sure ant would love it, too.